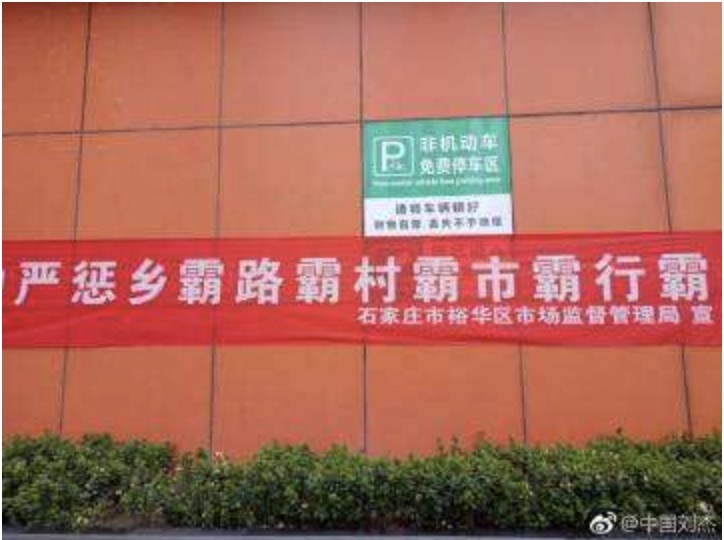 Those who do not know any written Chinese cannot feel the bewilderment that those who are literate in Chinese experience when they try to read this sign. 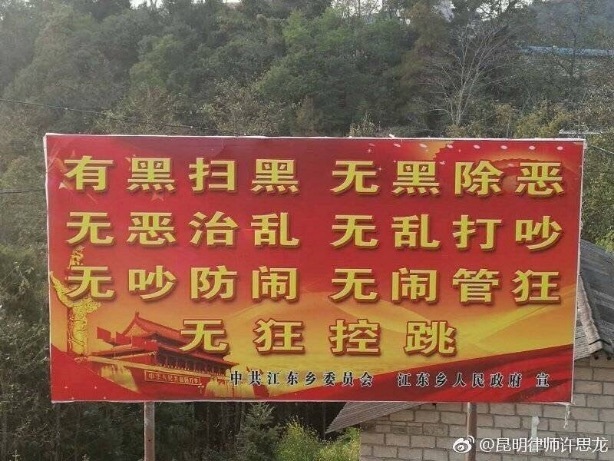 I will begin by saying that, of the dozen or so highly educated Chinese friends, colleagues, and students whom I asked about the wording on this sign, not one could fully understand it, especially the last line at the bottom. Netizens by the thousands who have been discussing it on the internet also declare that overall the language of the sign is incomprehensibly bizarre. 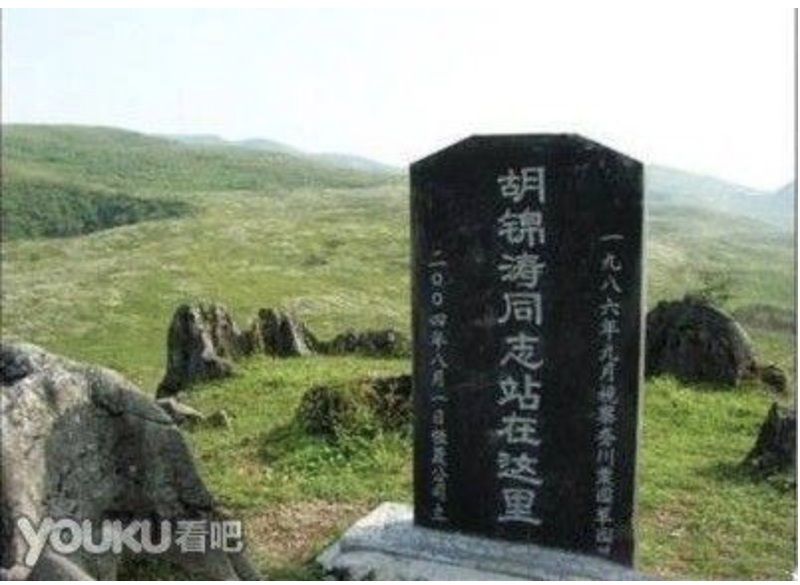 I will try to make some sense of the whole thing and speculate on why it is written in such a strange fashion, plus show with other examples of equally bewildering signs that it is not an isolated specimen in the PRC nowadays. Well, you sort of get the idea that the government is expressing its determination to keep order in society, but all parts of the message are not equally clear about how they intend to go about doing so. Although expressed at a crude, local level, these exhortations emanate from the highest levels of central government. The initial, and main, concern is to get rid of "black" (hēi 黑). And what is "black" (hēi 黑)? It is hēi shèhuì 黑社会 ("black social organizations"), namely the mafia, which is referred to as hēishǒu dǎng 黑手党 (lit., "black hand party") or hēibāng 黑帮 ("black gang", i.e., "gangsters") in Chinese. As one correspondent commented: "The sǎo hēi 扫黑 ('sweeping away blackness') movement looks like a nationwide campaign from the central government. I have seen signs like this everywhere in public and living quarters." So "black" (hēi 黑) is the primary target of the authorities, but it is often coupled with "evil" (è 恶), which is the secondary target of officials who are intent on combating nefarious elements in society. Thus, as on the sign above, sǎo hēi 扫黑 ("sweep away black") and chú è 除恶 ("get rid of evil") frequently occur in such texts parallelly or tandemly. In all seven quadrisyllabic phrases, the penultimate word / character is a verb. The verbs are all different, but they all mean basically the same thing: control, keep in check, eliminate, etc. 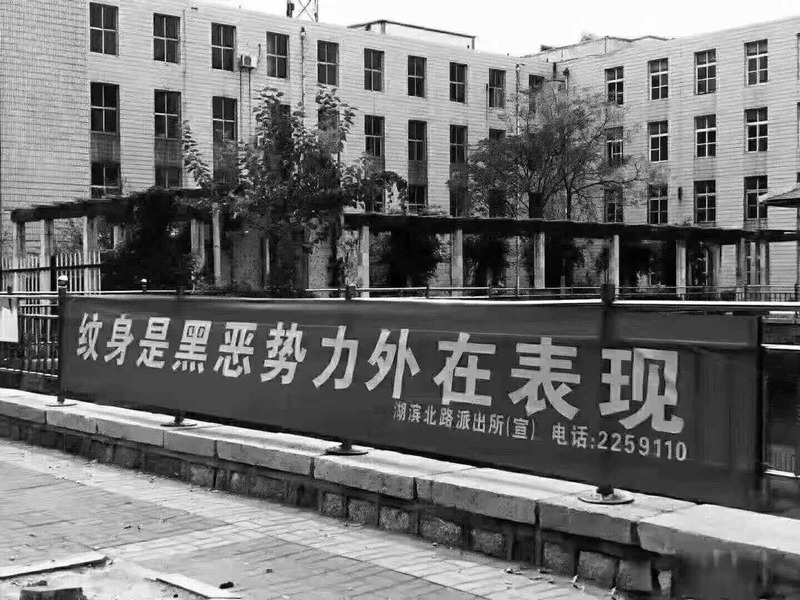 The author(s) of the text on the sign clearly expended considerable energy in selecting seven synonyms to express the idea of "control": "sǎo 扫“ ("sweep [away]"), ”chú 除“ ("eliminate"), “zhì 治” ("govern"), “dǎ 打” ("strike"), “fáng 防” ("prevent"), “guǎn 管” ("manage"), and “kòng 控” ("control"). The word I translated as "wrangling" could also be rendered as "quarreling". It generally refers to loud, unruly arguments, which are seemingly ubiquitous in some villages lacking in civility. The word I have translated as "disturbance" may be rendered as "trouble" or still more literally as "noise". It may sound strange to talk about preventing "noise", "but in fact, in rural settings, villagers sometimes hold raucous funerals and boisterous weddings that end up as carnivals lasting from days to a week" (according to one of my correspondents). The last, and most opaque, line prompted one correspondent to question: "Does 'kuáng 狂' signify madness (or mental diseases)? As for 'tiào 跳', does it refer to committing suicide by jumping off a building or into a river?" Some of my correspondents feel that the sign comes across as "funny", and that the activities the authorities are trying to suppress — making noise / disturbances, craziness / madness / wildness, jumping, etc. — taken all together do not seem quite right for human beings, even uneducated villagers. "I guess THEY want to keep a tight hand on even the slightest aspect of everyday life." To explain the motivation and mindset of local officials in producing this type of clumsy propaganda, which is widespread in Chinese villages, several of my correspondents referred to lawlessness in rural areas and the huge pressure that the front-line government employees are under to keep "the tumultuous and treacherous villages in order, and to how we have a gap of rural experts who can wisely prevent those undereducated villagers from falling into the trap of crime and joining mafia groups. Rural China is much more complicated than the monolithic conceptualization most people have of it." Such campaigns directed at pervasive lawlessness have been going on for quite some time, certainly before Xi Jinping became President, but they seem to be peaking in recent years. With so many Cultural Revolution-ish signs/slogans like this around me every day, I really have no idea what they mean, nor who they are intended for. No one ever explained. They just appeared all of a sudden. I guess it must be another political strategy Xi uses to work against some group / figure, and they (high up on their cloud) find it unnecessary to explain to commoners. I agree with you that hēi 黑 ("black[ness]", the most severe level they want to get rid of) might indicate organized crime, while è 恶 ("evil") could mean vices in a general sense. My first impression is that the last two phrases are strange. But they are on a government billboard, so they must make sense. I read it several times, I think that what they are trying to say is this: if there are no conflicts, then (we–the government) take control over the furious. If there are no furious ones, then (we–the government) take control over the active (in a bad way) ones. I actually found one online post of signs like this (this sign is included in that post); some people think these phrases are stupid and don't really make sense, while some argue that these signs are typically posted in rural areas where people are not very literate. So, for them, phrases like these are actually easier to understand because they are very colloquial. The locution is really strange, even difficult for a native speaker to understand. Its author tries to create four-word phrases (sì zì chéngyǔ 四字成语), intended for people to read aloud and memorize more easily, which eventually makes them incomprehensible. But I guess some of the words he uses must be typical in the propaganda of that specific locality. "Hēi 黑" ("black") means "hēi shèhuì 黑社会" ("black society", i.e., "gangsters, mafia, mobsters"). "È 恶" means "è shìlì 恶势力" ("evil forces", i.e., "pressure groups, vicious powers"). 1. Gangsters usually contain more people. They have their groups / organizations with leaders, core members, and group members of different levels. Evil forces usually involve three or more people, but not in a very structured way. 2. Gangsters usually have more money. They either have some profiting groups supporting them (some companies for patronage / support money to gangsters for their projects). Or some gangsters do business themselves. Evil groups don’t have much money. 3. Gangsters control over a greater region while evil groups only take over a smaller space. The crimes that evil groups conduct are not as huge as the ones for gangsters. 4. Some gangsters even have government members supporting them secretly. They conduct serious, big crimes. Evil groups are not protected and usually conduct smaller scale criminal activities: threatening shops for money, fighting in public, finding business for prostitutes, etc. (less serious crimes compared to gangsters) — they are local bullies, thugs, goons, and hoodlums. They can cause lots of trouble and hurt people, sometimes mortally, but their threat to society as a whole is not so far-reaching as the better organized and richly funded gangsters. The close linkage of "black" and "evil" in government propaganda campaigns is demonstrated by the existence of phrases such as these: sǎo hēi chú è 扫黑除恶 ("sweeping away blackness and eliminating evil") and hēi è shìlì 黑恶势力 ("black, evil forces"). Here's a website from a district security bureau that explains the differences between "black" and "evil" forces. 無（張）狂（之人）控跳（廣場舞 I have no idea about this!). The fifth kind of instability named on the sign at the top of this post is nào 闹 ("[noisy] disruption / disturbance / trouble"). In this particular instance, it is called yī nào 医闹 ("hospital disruption / disturbance / trouble"). 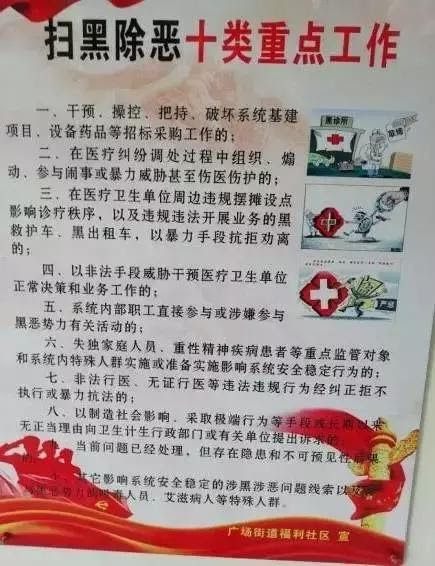 The sixth type of anti-black and anti-evil work listed on this hospital poster concerns families who have lost their only child and cases of mental illness, which are especially difficult to handle. Here follows a series of bizarre propaganda posters that I will only comment on briefly by way of complement to the above pièce de résistance. "Civilization has no bystanders; you and I are both humble pedestrians." N.B. : jiàn xíngrén 贱行人 ("humble pedestrians") must be a typo for jiànxíngrén 践行人 ("practitioners"). 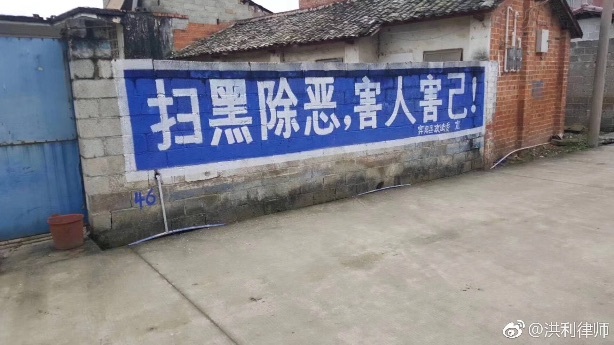 "severe punishment for township tyrants, road tyrants, village tyrants, city / market tyrants, trade / profession tyrants"
Government banner at an earthquake site. Note that it rhymes. "May you have higher exam scores than those who are tall, rich, and handsome; may you defeat the second generations of government officials." "Gāo fù shuài 高富帅" ("tall, rich, and handsome") and "guān èr dài 官二代" ("second generation of officials; officiallings") are popular phrases that were invented around 2010 and spread rapidly ever since. The children of officials in China often have a bad reputation for ostentatious display of wealth and bad behavior that is attributed to their privileged position. Looks like a tombstone, but he's still alive. They don't mince words. At least you know what they're thinking. Bottom line: going back to the last character of the last line on the sign with which we began this post, viz., tiào 跳 ("jump; leap; spring; hop; bounce; skip over"), nobody seems to understand what it means in the context of the whole text. I suppose this is an index of the paranoid angst that the authorities feel when confronted with the reality of the unpredictable power of the masses. Once they start "jumping", the government will be in real trouble. P.S. : One correspondent, partly out of desperation, even conjectured that the "jump" here refers to old ladies dancing ("tiàowǔ 跳舞") in public spaces, an abhorrent group activity that the government has repeatedly tried to wipe out in cities cross the People's Republic of China. The photograph in the "wénmíng méiyǒu pángguān zhě" poster actually shows part of the skyline in Singapore (compare: https://commons.wikimedia.org/wiki/File:The_Fullerton_Hotel_Singapore_(4639691284).jpg). 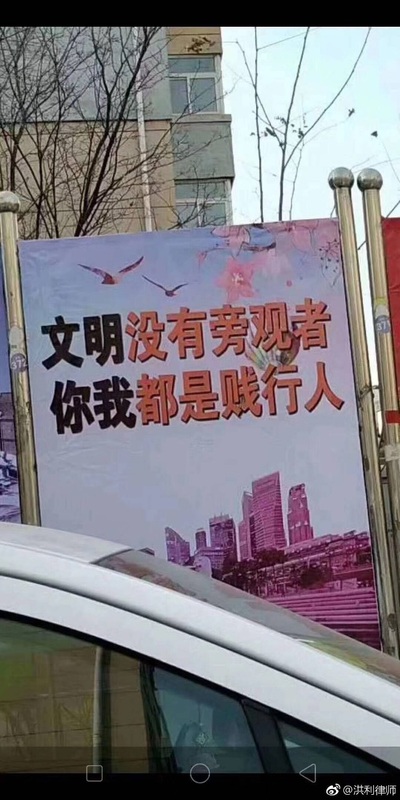 Were they just taking the first picture they found of a generic city skyline, or do comparisons to other countries/cities come up quite often in Chinese domestic political messaging? I kinda think "Darkness" would be a better translation than "Blackness". Hence "If there is Darkness, sweep away the Dark/ If there is no Darkness, get rid of the Evil" etc. Harm others and (you) harm yourself, is an idiomatic pattern in English to express a conditional: 'if you harm others, you harm yourself'. I don't think it works like that in the Chinese: I think the author's intent was that 黑 and 恶 害人 and 害己, so we must 扫 and 除 them. Interesting that the inscribers of the monument chose to use the very vernacular 站在这里 instead of a more literary expression. The authorities are afraid that if everybody in China jumped then the Earth would move. Haha, it's interesting that you found this hard to understand. I thought it was striking and fun, but it didn't strike me as hard to understand, perhaps because I didn't attempt to understand it on a word-for-word level. In companies and government departments, I've sat around the table with managers trying to work out the perfect slogan, and my experience is that the process is entirely random, subjective, and conditioned on the manager's aesthetics. I have never seen a manager even consider using any kind of external verification ("does this make sense to anyone but me?"). The process is simply starting with the key elements, and brainstorming until the boss says, "That's the one! I'm really feeling that one!" And then we have our new slogan. I read this as actually being about focusing resources: Dear village officials, please focus on dealing with the worst crimes first. So it sets up a series from the obviously worst – hei – to the obviously least bad – tiao. If I don't know exactly what those refer to, it doesn't matter too much to me, because I understand their role in the chain of badness. I read this chain roughly as: hei/organised crime – e/corruption/serious crime – luan/violence – chao/public disturbance – nao/protests – kuang/drunkenness – tiao/…yeah, I'm not sure about that one! But it doesn't matter, it's only there to be part of the rhythm. Those accompanying verbs that Prof Mair notes are a lovely example of how Chinese nouns really want a verb to keep them company, but the verb often doesn't carry any additional meaning in itself. I'm a Chinese-English translator, and I mutter "kill those verbs!" to myself on an almost daily basis. old ladies dancing ("tiàowǔ 跳舞") in public spaces, an abhorrent group activity that the government has repeatedly tried to wipe out in cities cross the People's Republic of China. … it is impossible for me to tell if this is satiric or not. Googling reveals it is not. My people! Women too old to GAF, dancing in public! Because they like it! Prof. Mair wrote: "[O]ld ladies dancing ("tiàowǔ 跳舞") in public spaces[ is] an abhorrent group activity that the government has repeatedly tried to wipe out in cities cross the People's Republic of China." _This_ is a threat to the Party's power structure? Would you mind "unpacking" that one a bit, for those of us who are not Sinologists? I mean, I get a little miffed whenever I have to fight my way through polka-dancing babushkas on my way to the pierogi line from time to time, but it had never occurred to me that these ladies might be part of a coordinated plot to overthrow the government. Doesn't black also resonate ominously with the "Five Black Categories" [黑五類] and other uses of "Black" during the Mao era? Could the "old ladies dancing" be a reference to Falun Gong? Prof. Mair : "[O]ld ladies dancing ("tiàowǔ 跳舞") in public spaces[ is] an abhorrent group activity that the government has repeatedly tried to wipe out in cities across the People's Republic of China." Hilarious, made me laugh very hard. I do believe "jump" (tiao) , the last item of things to wipe out, is short for "tiaowu" (dance, dancing). These old ladies dancing with their speakers blasting in the early morning are the new obnoxious teenagers ! If they can dance in public spaces, China is a free country ! That phrase sǎo hēi chú è 扫黑除恶 ("sweeping away blackness and eliminating evil") is visible everywhere. Even my school put up banners, and the LED panel at our athletic field flashes the phrase. I don't think anyone really get what it means. I think that is also part of the beauty of it. Because there is so much room for interpretation, it could apply to almost anything. If I meet someone who sounds like they really know what they are talking about, I will be sure to let you know. The line about restraining jumping immediately put me in mind of Chinese hopping vampires. Maybe the CCP is afraid of an undead rebellion. Does this sense of "black" have anything to do with the English term "black market"? It seems like a similar meaning, at least. 害人害己 can be understood as "by harming others you harm yourself".